My husband and I disagree. He says foods like chili, taco soup and chicken and dumplings should be served year round. I say they are seasonal foods, best enjoyed during the cooler months. Much to Mr. Hines’ dismay, I hold out and wait til the first cool front before I cook a warm, hearty meal like chili. I’ve actually shared my chili recipe with you before, but with Fall just around the corner, I thought it would be a good time to bring it out again. And this time, you get a printable version for your recipe book. 1 lb. of ground chuck- ground chuck is 80/20 on fat content which is why I like it. You can buy leaner meat if you prefer. Brown the ground meat over medium high heat. While the meat is browning, chop up the onion, pepper and garlic. Once meat is browned, scoot it over to one side of the pan and saute the vegetables in the fat. Add diced tomatoes and the next four ingredients. Stir well to mix up all of the ingredients. Bring chili to a bubble over medium high heat. Once bubbling, reduce heat to medium low and cover to simmer. Let simmer for about 30 minutes. And here’s the printable version. This chili has just the right amount of spice. Serve over rice or with fritos and cheese. I’ve since discovered I have several food sensitivities and have had to modify some of my favorite recipes, including this one. I’ve substituted green onions for the white one, saute the meat in garlic infused olive oil instead of using garlic, and have eliminated the beans altogether. It’s still delicious! In fact, Mr. Hines and I like this version better. Whichever version you choose, try serving it with a chopped autumn salad and some cornbread. Enjoy! 4 Common Household Odors Gone for Good! 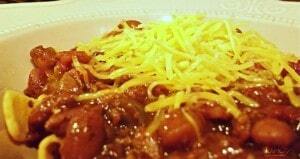 We love chili and soups, thank you for this recipe!! But, I also think it is seasonal food. I only make such foods when the weather turns colder. Too hot for chili and things like that, they are perfect for days you want to warm up. I’ve used a combination of Ranch beans and the chili beans before…I grew up on using the Ranch style beans, so it’s my go to. Agreed. My sons and I have this battle all the time. There are just some foods that are seasonal. chili, my red sauce, lasagna, stews, soups…. Things that requited lots of hot cooking time . The weather has to be chilly for these foods in my eyes. I make pasta year round… but with light garden sauce, or white sauces. Thick red sauce takes too long to make a proper one… lots of simmer time. Hmm… never made chili with canned beans before. Will have to try. I just want to tell you that I have used this recipe over and over again. There isn’t another chili recipe that compares!! Thanks so much for sharing! Thank you for taking the time to tell me. I’m flattered and delighted someone is getting as much enjoyment out of this recipe as we do. Do you mind if I quote you when I share the recipe on social media? Haha not at all! It truly is the best! I’m Mrs. Hines, a.k.a. Sharon. I’m a wife, a mother and a teacher. I’m also an extroverted introvert who is partial to red wine and loves live music. My home and the beach are in a tie for my favorite happy places. And I love to laugh. Enter your name and email address to get your Free Guide.